Older people in Western communities are the single largest demographic group at risk from inadequate diet and malnutrition. Their nutritional status is associated with increased hospital admissions, and it is an important determinant of morbidity. This risk is disproportionate in comparison to other age groups and needs to be a primary consideration in determining the appropriate management of the older person. Chronic illness, heavy use of medication, and periods of lengthy hospitalization are often underlying causes of nutritional deficiency. In addition lifestyle factors, immobilization, isolation, and physiological factors associated with aging compound the risks and affect the ability of the older person to meet nutritional needs or to digest, absorb, utilize, or excrete nutrients that are ingested. Improvements in healthcare, nutritional status, and living standards have resulted in more Americans living to an older age. In order for the gains in life expectancy to be viewed as a positive demographic feature, the additional years need to be quality years with attention focused on approaches that can retard the losses associated with aging. Of specific interest is the role nutrition may play in attenuating these losses and promoting functional independence and optimal wellness in an aging population. 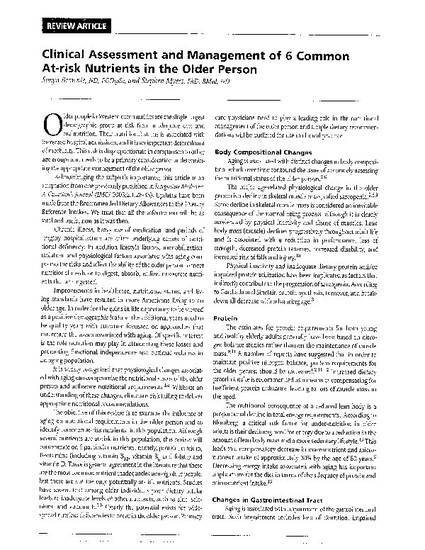 Brownie, S & Myers, SP 2009, 'Clinical assessment and management of 6 common at-risk nutrients in the older person', Integrative Medicine: A Clinician's Journal, vol. 8, no. 5, pp. 32-37.